Yesterday I mentioned a great book on the doctrine of Justification, but, undoubtedly, some of you might be put off by the thought of a 500 page 19th Century tome. 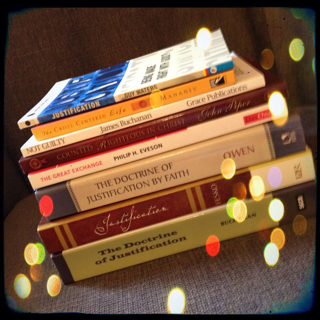 So today, I've got some more recommendations of good books on justification pitched at all sorts of different levels. So no matter how big or how small your appetite is for good doctrinal reading, there should be something good here for you. This is a very small book, and it's very easy to read. Yet, it remains one of my favourite books of all time. If you haven't read this, go and read it now! Waters gives a brief but solid introduction to justification and even touches on some recent attempts to undermine this doctrine on which the church stands or falls. At just about 200 pages, this book gives a very clear overview of the biblical teaching on justification, the difference between evangelical Protestants and Rome with regard to justification, evaluates N.T. Wright's position, the importance of the doctrine, and its results and implications. This is the one I recommended yesterday. Probably the most thorough book that exists on the evangelical Protestant doctrine of justification by grace alone through faith alone. Buchanan looks at it both historically (which is excellent for dealing with significant errors and distortions of the doctrine) and theologically. Yesterday I posted his 33/34 Propositions on Justification. The classic Puritan treatment. It's Owen, so it's not easy reading, but it's Owen, so it's well worth the effort required to read! Fesko is a good, up-to-date companion to Buchanan, dealing with many of the issues that have arisen in the intervening century.